Welcome to our new web site. Arlene and I are busy remodeling our kitchen. We also busy at work: Dey Appliance and the Fargo Public Schools- Hawthorne Elementary. 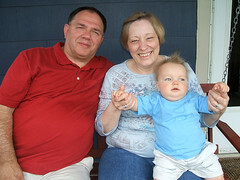 We are also enjoying our new grandchildren: Palmer (Appleton, WI) and Kira (now back in Fargo, ND). We are also active in our church: Good Shepherd Lutheran (Moorhead, MN). It's exciting as our church has a brand new building. We help sheet rocking the nursery at Beth and Noah's house. Noah also ran and finished the Green Bay Marathon. I traveled to Norway with my Mother (Eleanor), my brother Craig and sister-in-law Jackie. Joining our party was my cousin Curt Haughvedt and his family: Candy, Erica, and Andrea (Ohio). Visiting from Germany we were joined by: Aren, Conny, Kirsten and Melanie Haughvedt. We rented a house and travel around my car. We visited our Norwegian relatives. The weather was excellent. 2004 - Building New edition on our house. Flickr.com - Now that I have a digital camera, this is the location for all my current photos. To see the personal (non-public) photos email me for an invite. SchafferPhoto.com - Myron's Photo Site with photos of the family including our newest addition Kira. PresentLikeAPro.com - Sara's company web site. SaraSchaffer.com featuring her "Up To Know Good" messages. Check out the UTKG Archive.